The next major version of Android is here. 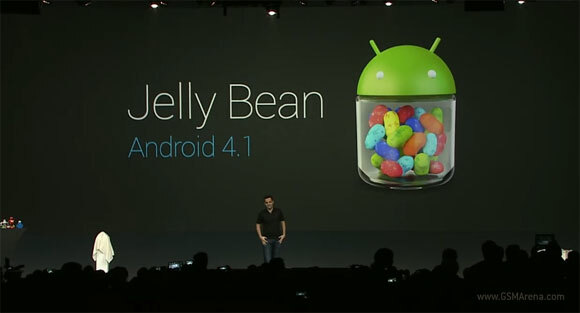 Carrying the name Jelly Bean, Android 4.1 puts plenty of new features and performance updates to the table. Firstly, Jelly Bean focuses on performance. More specifically, improving UI responsiveness. Google has dedicated a whole project codenamed Butter to improving Android performance. By making the vsync of the screen at a constant 60 frames per second, it makes the UI smooth as, you've guessed it, butter. It even goes as far as to anticipating where your finger is and start drawing from that point to make the UI appear even smoother. Google showed two Galaxy Nexus smartphones, one running Ice Cream Sandwich and the other Jelly Bean to demonstrate the huge difference that Project Butter makes. It's really quite impressive. The keyboard typing is also improved, with better and more accurate predictive input and extended dictionary. On top of that, Voice Typing in now available offline. This means that it no longer requires data connection to work and its performance won't be affected by its slow speed. On the demo it worked pretty well by fixing a misheard word (from Known to Though. Accessibility has also been improved adding new gestures and external support for Brail input. Taking photos got more intuitive as well. Jelly Bean brings new UI and gestures, so you can swipe sideways to access the gallery (yes, just like on the WP smartphones). You can then quickly delete images by swiping them off the screen. The notification bar has also seen its fair share of changes. It shows you a more prominent looking clock and allows notifications from various apps like Music, Pulse and Gmail to be expanded to give you more details without having to open the app. The Google search has been significantly altered too. Natural language commands are now supported as Google is obviously ready to mount a serious challenge to Siri. When you initiate a search you get a minimalist design card. What’s really cool is when you swipe to the left it shows you a list of Google Search results. Google Now is another new part of Google Search, which can show you public transport listings, flight information as well as sports results. I have Sony Ericsson Live With Walkman I already updated to android 4.0 I want to upgrade my phone to android 4.1 when my phone new update came?